What are the neighbors up to? 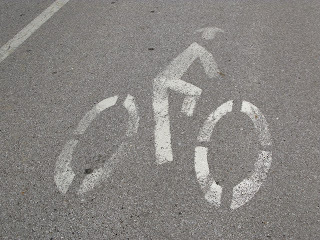 It seems last December, the Tennessee Department of Transportation adopted a new Bicycle and Pedestrian policy. This policy brings bicycle and pedestrian needs onto equal ground with automobiles in that state DOT's planning and design process. What's going on in Missouri? Missouri Livable Streets is working with the Missouri Department of Transportation to develop a livable streets design manual. This manual - planned for release in the next couple of months - will offer design livable streets guidance to local and state transportation designers. Various elements planned for inclusion are sidewalks, trails, bicycle facilities of every stripe and crosswalks. When the Design Manual is ready we'll note it here and place it on the website. That's www.LivableStreets.Missouri.edu. There is a lot of livable streets activity happening lately in Missouri communities. Eleven Missouri cities have livable streets policies. Our House of Representatives is considering a Complete Streets bill. Several organizations - including Missouri Livable Streets - are spreading the message to local governments and advocacy groups. What is a livable street? Simply put, a livable street is any transportation facility that provides access to safe, physical activity for all residents regardless of age or ability. Livable streets are context-specific, that is, different street segments call for different elements. These elements can include sidewalks, bicycle facilities, crosswalks, mid-block crossings, countdown timers, pedestrian sanctuaries, street trees and transit. Missouri Livable Streets is a grant funded project of University of Missouri Extension, the Missouri Department of Health and Senior Services and the Missouri Council on Physical Activity and Nutrition. Funded by the American Recovery and Reinvestment Act (ARRA), Missouri Livable Streets is dedicated to helping all communities improve their quality of life by investing in their streets, roadways and sidewalks. For more information see our website www.livablestreets.missouri.edu and 'Like' us on Facebook.